These chicken parm bites are something that Heather came up with back in June of 2012, very early into our real food journey. 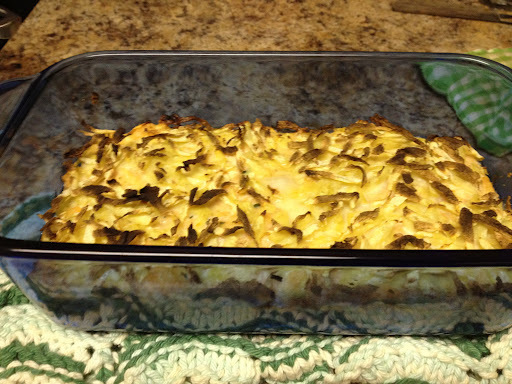 Lucky for us, we had started this blog, so the recipe was kept documented. Unlucky for us, we were very new with our presentation, so neither our directions or pictures were especially helpful. Another win in our favor is that we have since made great friends in the community who led us to take better pictures and inspired us to do better work. As this is one of our favorite recipes, we updated it recently to share with you. This is absolutely fabulous, and I think you will really like it. These little “parm poppers” are delicious on their own, but definitely are well suited to the zoodles and red sauce. I would gather you could likely use this wash and coating on larger cuts of chicken as well, but we haven’t tried it just yet. Either way, we hope you’ll love this creation. Let us know what you think! We’ve been making a lot of recipes from the 21 DSD program and our favorite Paleo sites lately (PaleOMG, Primal Palate, Mark’s Daily Apple, etc.). So, tonight for dinner, I wanted to be a little creative. Ok, maybe creole tilapia isn’t all that creative… but at least it isn’t something we’ve found on any other specifically Paleo website, so there! The best part is, this recipe is really quick and easy. Blend all the spices together in a small bowl. 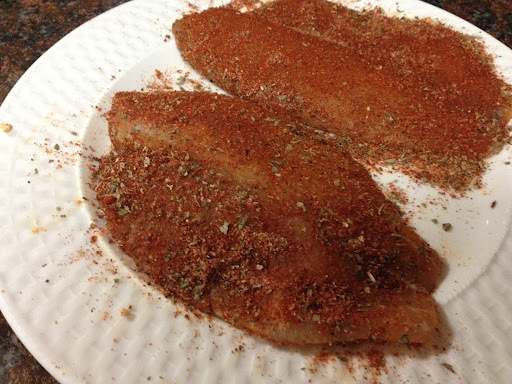 Dredge the tilapia fillets in the spices. Make sure both sides of each fillet are fully covered in the spice rub. Heat the oil over medium-high flame. 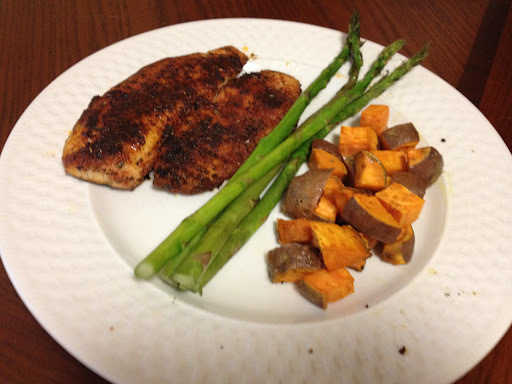 As you can see, I paired my creole tilapia with roasted sweet potato and asparagus because that’s what we had in the house that needed to be used. However, I think sautéed kale would have been better than asparagus. You could also serve this over cauliflower “rice” instead of with sweet potatoes. For the heat seekers: To get a really good bite, use 1/4 to 1/2 teaspoon more of the cayenne, garlic and pepper. P.S. This recipe is Paleo, Whole30 and 12 DSD friendly. Enjoy! This recipe is one of our all-time favorite burger recipes. Growing up both with families from the Midwest, grilling and hamburgers are staples of the American diet. 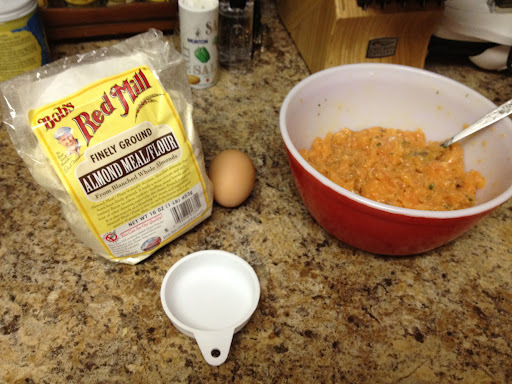 We originally posted this recipe back in April of 2012, just 2 months into our paleo, real-food journey. 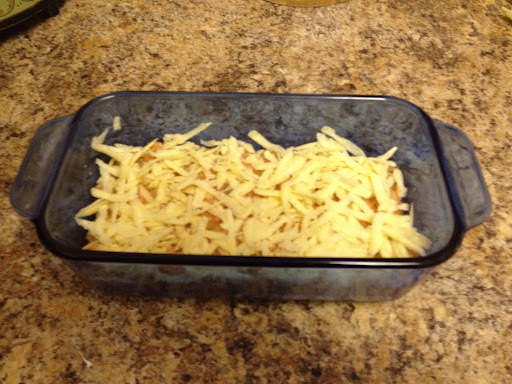 Boy has a lot changed, and the look of this post (and the recipe) needed a little revision. These are super easy and can be put together in under a half-hour, especially if you’re making a half-recipe or using an outdoor grill. The chipotle chili pepper powder is totally optional, but it does add a nice flavor to the burgers. A few weeks ago we made these awesome Basil Salmon Burgers from Loren Cordain’s The Paleo Diet Cookbook, but we had so much basil-salmon mix that we chose to freeze some of it for a later date. 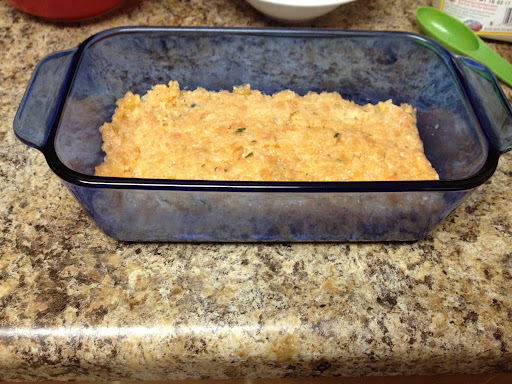 This weekend, I was feeling a bit creative and realized we could use the mix to make a salmon loaf. Why not, right? Toss in a little almond flour, some egg… shouldn’t be too hard. I was so proud of myself–I thought I was being really quite clever and unique. Only later I called my mom to tell her about it, and she said “Oh! 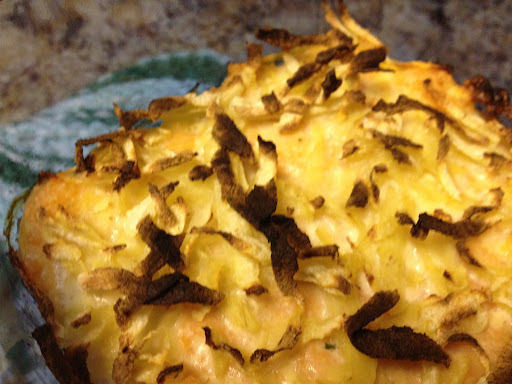 I have a great salmon loaf recipe from Grandma.” It deflated my spirits a tiny bit, but no matter. I was still excited to try it. It really was quite easy! I mixed together approx. 3 cups of the basil-salmon mixture, 1 egg and 1/4 cup of almond flour. Then Brent suggested topping it with some of the shredded white sweet potato we had left over from other recipes, for the sake of texture. I baked it at 350 for about 40 minutes. It came out beautifully. It was not quite as salty as the basil-salmon burgers, and the crunch from the shredded sweet potato was really a nice touch. Oh, and I forgot to mention: we didn’t bother greesing the pan. Salmon is such a fatty fish; if you’re starting with a salmon filet like we did (instead of from the can like my grandmother used to do), there should be plenty of natural oils to keep it from sticking. I worked from home the past few days because I haven’t been feeling well–this Whole30 thing has really sent my body’s internal organs on a crazy ride. Hopefully, everything settles down soon; for now, I’m doing my best to tough it out. I would never have thought to make my own tea, nevermind sage tea. 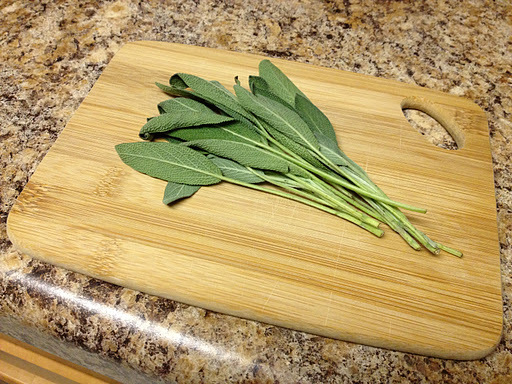 But today, a friend suggested it for my upset tummy and I remembered that we had fresh sage in the fridge. So I did a quick Google search for “how to make sage tea” and tada! an easy recipe was at hand. I didn’t actually follow the recipe. That would be too easy! 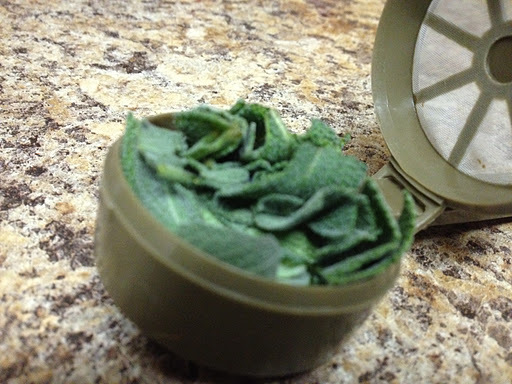 :-p Instead, I just tore up enough sage leaves to fit into my tea strainer, heated some water, and let it steep. The recipe lists lemon and honey as optional additions. 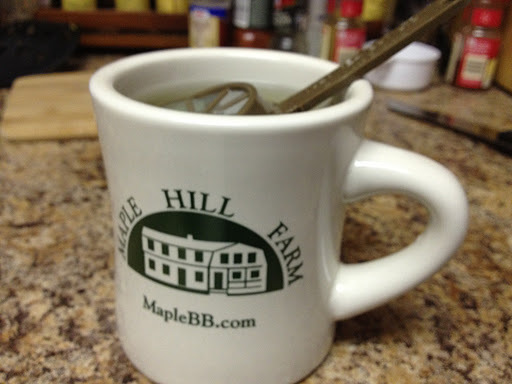 Honey is obviously not a Whole30 menu item, and I wanted to experience the flavor (and hopefully the helpful effects) of this tea in its original form so I didn’t add the lemon either. Full disclosure: I pulled this recipe from Civilized Caveman and played around with it a little bit. It was delicious; spicy and flavorful and ridiculously juicy. I forgot how much better bone-in and skin-on chicken is, and the best part is that it’s less expensive than the prepared stuff.